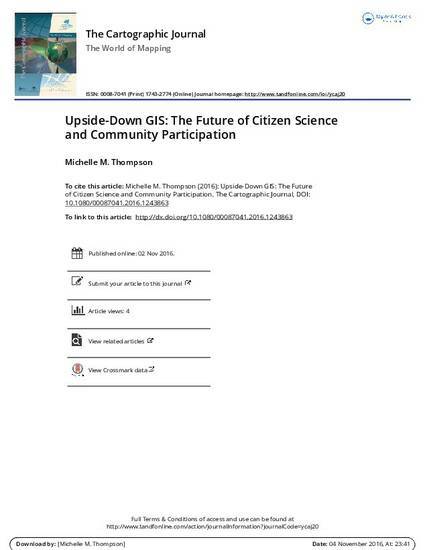 "Upside Down GIS: The Future of Citizen Science and Community Participation"
This article will focus on the changes in time, technology and data that have affected traditional partner relationships using participatory geographic information systems (PGIS). Project development roles of reliance held by the community, and managed by university agents, has shifted from cooperative to, in some cases, complete independence. The modern model of citizen participation includes a resident-planner toolkit with greater access to neighbourhood data and low- to high-tech analytical tools. Many community-led quality of life studies have a limited scope and focus on policy issues that do not serve a larger constituency. Many neighbourhood plans exclude self-reported neighbourhood knowledge and, due to the frequency of municipal reporting cycles, leaves gaps and data mismatch. Given this, the traditional public participation GIS (PPGIS) model may be less data driven due to a more mission-driven resident-led PGIS solution. Planners in practice and in academia have raised levels of concern about data standards, interoperability, reliability, error and metadata. How and why Citizen Science influenced the progression of PPGIS, participation GIS, crowdsourcing and now community-managed data in both theory and practice are provided. This paper will reflect on how top-down strategies to include neighbourhood knowledge are being reframed by the United States Federal Community of Practice. The future of data integration focuses on both the process and products of data development from both the bottom-up and top-down perspectives. 2015 Impact Factor: 0.569, a 90% increase.